Howard Leight by Honeywell Quiet Reusable Foam Ear Plugs Uncorded w/Case (NRR 26)5Richie DAugust 25, 2014Great in cutting down noise when I ride my motorcycle. Easy to put on and very comfortable throughout my rides. It doesn't hurt for prolong use. Very soft and easy remove as well. Comes with a case for easy storage. Howard Leight by Honeywell Quiet Reusable Foam Ear Plugs Uncorded w/Case (NRR 26)2EYNovember 19, 2013I got these for motorcycle use, but I found it doesn't seal your ear from noise nearly as well as a disposable foam plug does. If you're thinking about a reusable plug I recommend you stick to the disposables. I give it two stars because this pair was better than another reusable plug that I tried. Howard Leight by Honeywell Quiet Reusable Foam Ear Plugs Uncorded w/Case (NRR 26)5C WarrenNovember 18, 2013I've used these for travel..and at home (snoring hubby!). They're comfortable and work great. Howard Leight by Honeywell Quiet Reusable Foam Ear Plugs Uncorded w/Case (NRR 26)5Sarah G. DeLuzioApril 9, 2012My 80 yr old mother has very sensitive ears and they were pinned back in her 20's, so fitting them has been impossible. 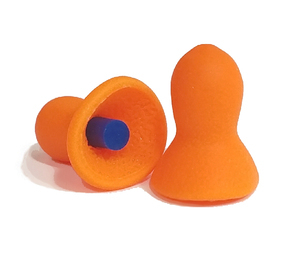 These earplugs are absolutely perfect! They are so easy for her to install and they fill the canal completely. She just reported back on her first bearable (quiet) MRI. Thank you!!! One less thing I have to listen to complaints about:). Howard Leight by Honeywell Quiet Reusable Foam Ear Plugs Uncorded w/Case (NRR 26)3bryanjDecember 13, 2010I bought these as a back-up to the do-it-yourself custom fit plugs. They work well but the other set I got was more comfortable. These are about what anyone would expect from a set of foam earplugs. Relatively comfortable with good hearing protection.